¡Vamos a ir a México! Hotel Isabela is a great place to stay in central Mexico City. 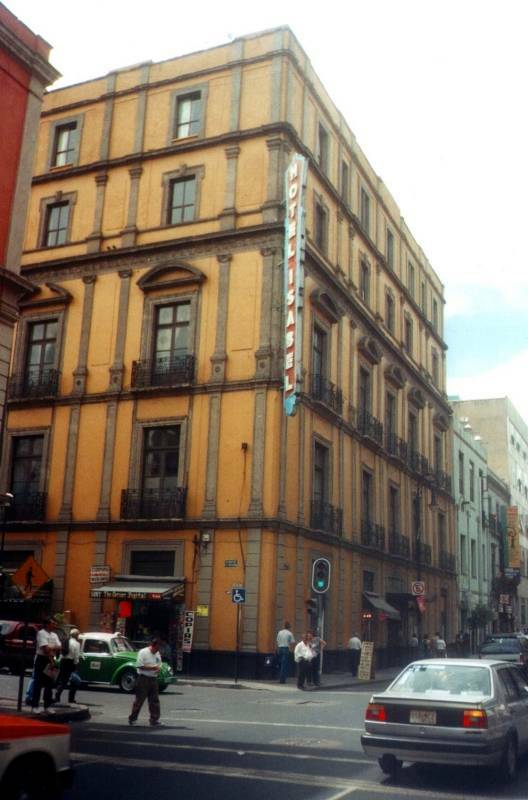 It has nice rooms, a restaurant and cantina, and it's centrally located very close to the Zócalo. There are a lot of little restaurants and taquerias in the area. Just west of that hotel on El Salvador between Bolivar and Eje Central Lázaro Cárdenas is what would appear to be the daily Dayton Hamfest of electronics. Stereos, cell phones, antennas, cable, connectors, electronic components, and more. I picked up a very nice multimeter that also measures inductance and capacitance, and tests transistors, for about one-tenth the price I would expect. Here's the Hotel Isabel and the view from the window. National Museum of Anthropology — Wow. Plan on spending the day. 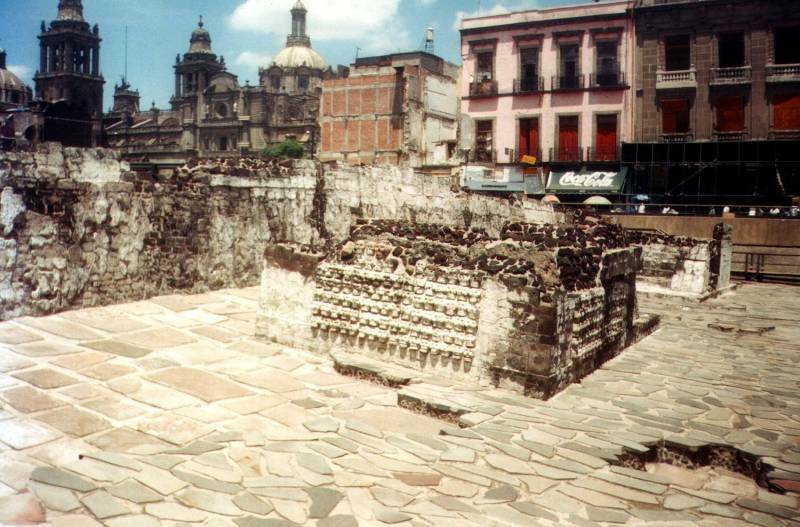 The Aztec ruins of Tenochtitlán just off the Zócalo. Basilica of Guadeloupe — take the Metro to La Villa Basilica and walk a few blocks. Museum of the History of Mexican Medicine, which has some truly gruesome latex models of various ailments, including several varieties of veneral disease. 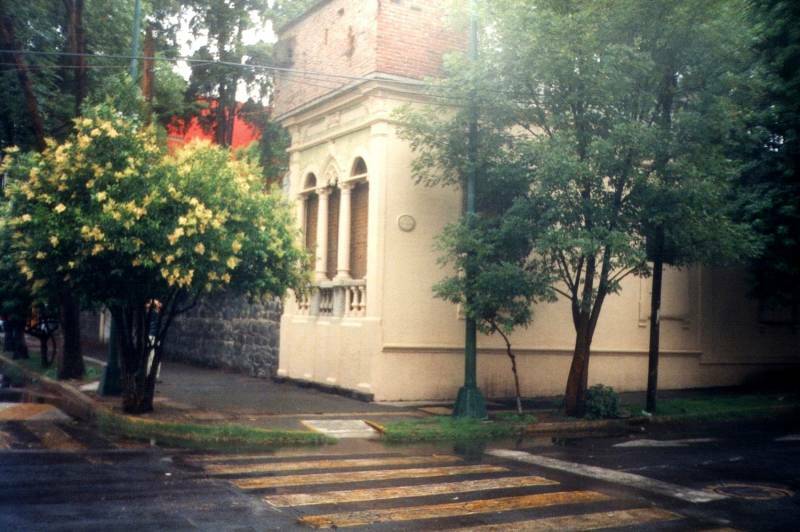 Casa del Leon Trotsky. The home of a prominent Soviet figure who fled into exile and was assassinated with an ice ax. I have an entire page on the ironic humor to be found here. The Aztec ruins of Tenochtitlán are just off the Zócalo at the center of Mexico City, more properly known as Ciudad de México, or simply as D.F. (for Distrito Federal). Tenochtitlán was founded in 1325 on an island in Lake Texcoco, which covered much of what today is Mexico City. The Aztec civilization's state religion awaited the fulfillment of a specific prophecy: that the wandering tribes of people would found a great city on a spot signaled by an eagle eating a snake while perched on top of a cactus. They saw this vision on the island, and started building a Nahuatl city-state which became the capital of the growing Aztec Empire. The eagle, snake, and cactus appear today on the Mexican flag. mētztli = "moon" → "Me"
xīctli = "navel" → "xi"
-co = Nahuatl locative → "co"
Me-xi-co = "at the navel of the moon"
Look in an atlas and compare place names in Mexico and Spain. All those letters x and bigrams tz and tl, those are Nahuatl names. The city was connected to the mainland by causeways in the four cardinal directions. Bridges crossed gaps in these causeways, and the bridges could be pulled back to defend the city. Two terracotta double aqueducts, each more than 4 km long, brought fresh water from the springs at Chapultepec. Water from mountain springs was preferred for drinking. Most of the population bathed twice a day. There were latrines in private homes and public latrines in squares and main streets. Human excrement was collected and sold as fertilizer, and about a thousand men were employed as street cleaners. Then the Spanish conquistador Hernán Cortés and his forces arrived in November, 1519. His men were flabbergasted at what they found. Tenochtitlán was one of the largest cities in the world at the time. With its population of over 200,000, Europe's only larger cities were Constantinople, Venice, and Paris. Trade was maintained with the east coast on the Gulf of Mexico and the west coast on the Pacific Ocean, and may have extended as far as trade with the Inca Empire of South America. The water and waste handling was completely foreign to men from Europe, where cholera was endemic and streets carried slow-flowing open sewage into the late 1800s. In Europe, human waste was collected in chamber pots overnight and simply thrown out the window, and bathing was done seldom, if ever. "When we saw so many cities and villages built in the water and other great towns on dry land we were amazed and said that it was like the enchantments [...] on account of the great towers and cues and buildings rising from the water, and all built of masonry. And some of our soldiers even asked whether the things that we saw were not a dream? [...] I do not know how to describe it, seeing things as we did that had never been heard of or seen before, not even dreamed about." As the Spanish saw it, there was nothing here that they couldn't improve through complete destruction, and so Cortés' men systematically leveled the city. The Templo Mayor, the main temple complex, was disassembled and the Spanish colonial government was built on top of it. 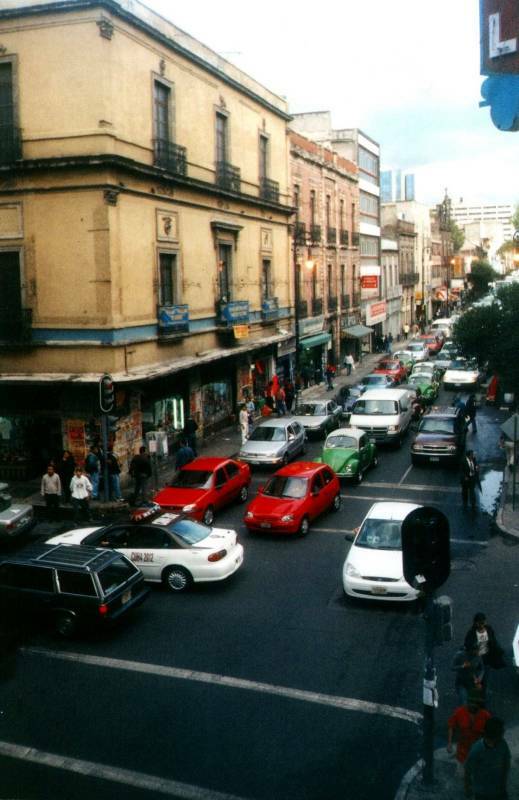 The Zócalo, Mexico City's main central square, is on the location of Tenochtitlán's original central market and plaza. 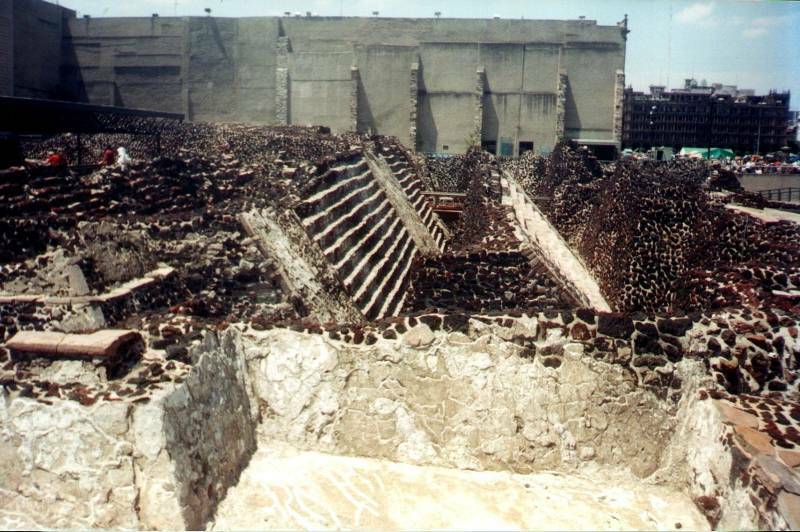 The Templo Mayor's location was discovered in the early 1900s, although it wasn't excavated until 1978-1982. That was when utility workers discovered a huge stone disc depicting the Aztec moon goddess Coyolxauhqui. The 4-meter-diameter Stone of the Sun, or the Aztec calendar stone, was found in the Zócalo in 1790. It had been carved around 1470, to tell Aztec history and prophecy of the future. Formally, the Zócalo is Plaza de la Constitución, but everyone simply calls it the Zócalo. It has been the central gathering place since Aztec times, and the name is used for the main square in many Mexican towns. 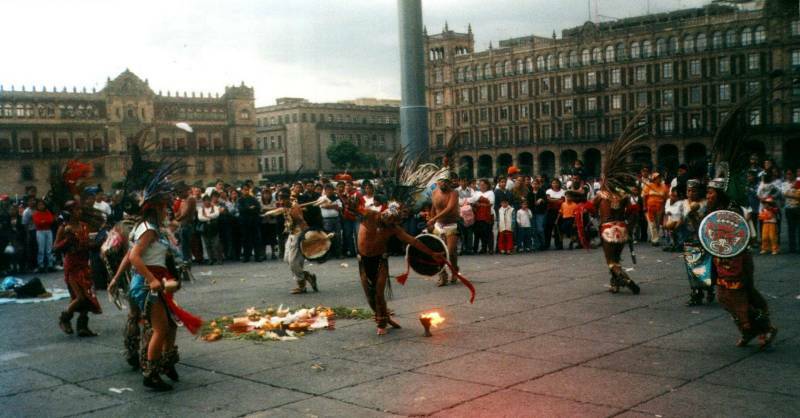 Native dancers perform on the Zócalo. Behind them is the Palacio de Ayuntamiento at the southwest corner of the Zócalo, the city's seat of power since the Spanish conquest. It's enormous, 240 meters on a side and one of the largest city squares in the world. 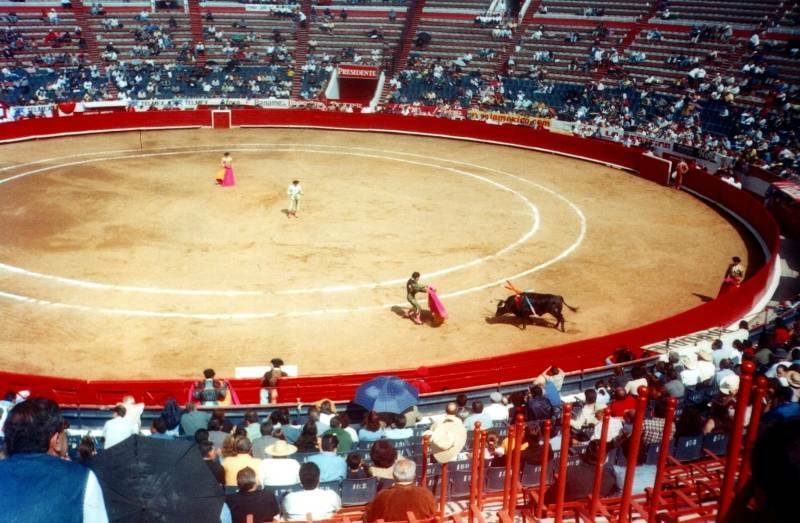 This is the corrida, or bull-fighting ring. I saw a minor-league bullfight. There were three toreadors, one of whom was good, and one of whom seemed to be whittling the bull to death. Finally the bull-ring staff member known as the Bovine Angel of Death steps in. One stick in the neck with what would appear to be a steak knife, and the bull falls down dead. This is Leon Trotsky's house. There are plenty of ironic sights to be found here. Pulque is a traditional beverage made from fermented agave sap. It's thick and slimy, like celery and grass clippings and Elmer's glue and a little tequila spun in a blender. It's kept in wooden barrels behind the counter and served up with a big metal ladle. Pulque is somewhat hard to find. You have to find a pulqueria in Mexico as it isn't exported. In fact, you have to find a pulqueria in the right region of Mexico, as it isn't transported very far even within the country. One pulqueria in Ciudad de México is the Pulqueria de los Dualistes across the street to the east of the Mercado San Juan. The Pulqueria de los Dualistes is a typical example. It's fairly grungy — the front corner is a separate room (with separate entrance from the street) for women and families. The main room has a urinal in the corner, and a toilet in a stall. They had four varieties of pulque — the two most popular were blanco and curvado (white and green). They also had pink and magenta. It's served up in 20-ounce mugs for M$8. We learned later that you can get a half-size vasa. What they really need is the pulque sampler — a tray with a small glass of each flavor. 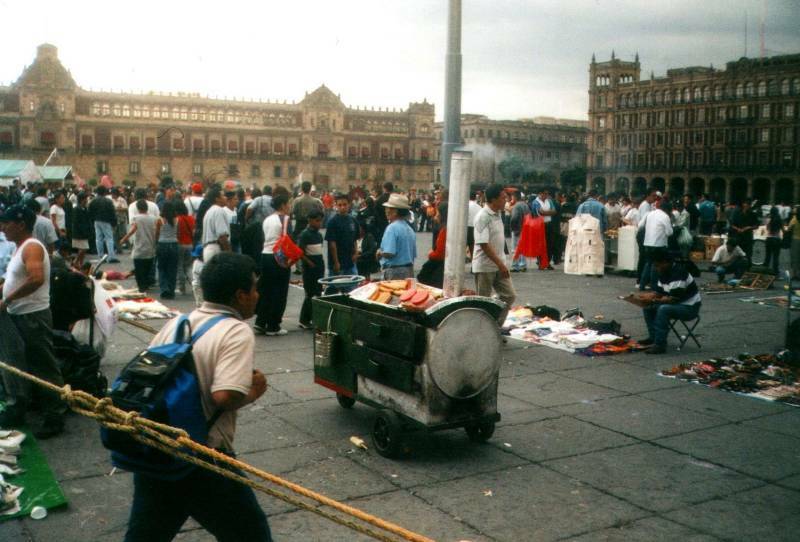 By 2014, pulque had become popular with Mexico City hipsters. See the article So this is what Mexico's hipsters are drinking now on GlobalPost.com. 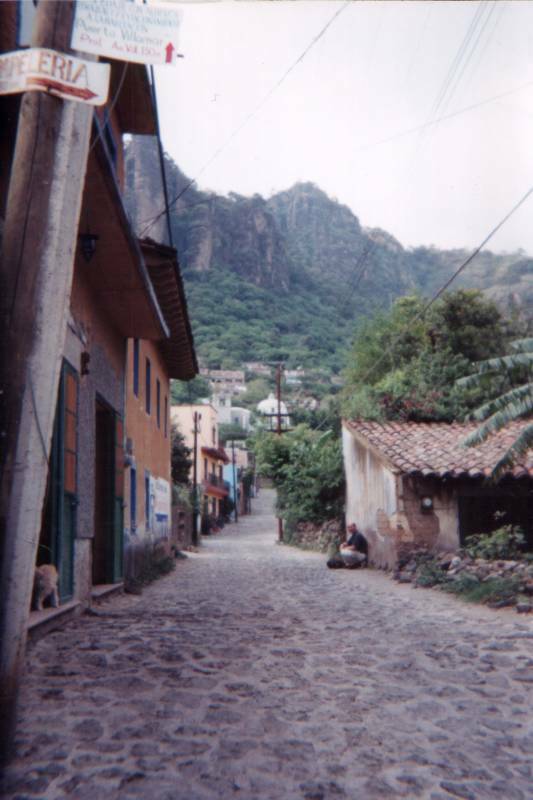 Tepoztlán can be visited as a day trip out of Mexico City. It's one or two hours by bus to the south. There are buses between Mexico City's Terminal Sur about every hour during the day. The trip there is on either highway 95 or the toll express highway 95D. The bus line's choice of highway will affect the price and the time. Both highways climb to about 10,000 feet crossing the mountains, that's a gain of about 2,600 feet from Mexico City. 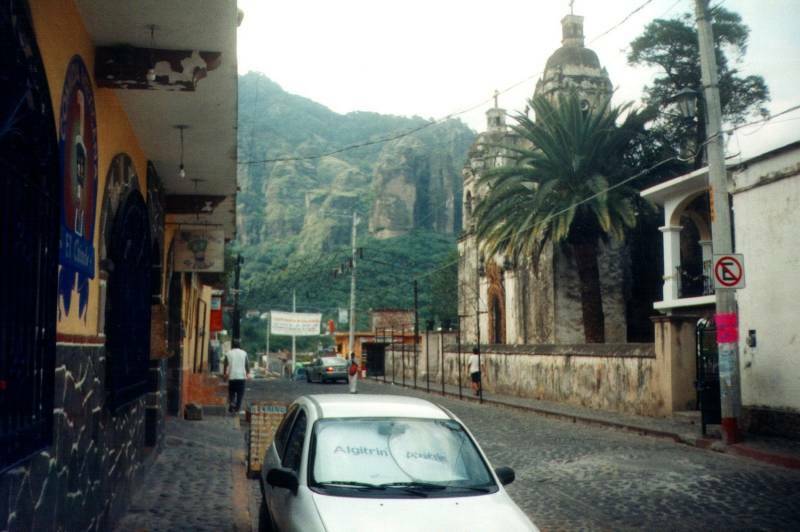 Then highway 115D branches off to Tepoztlán. 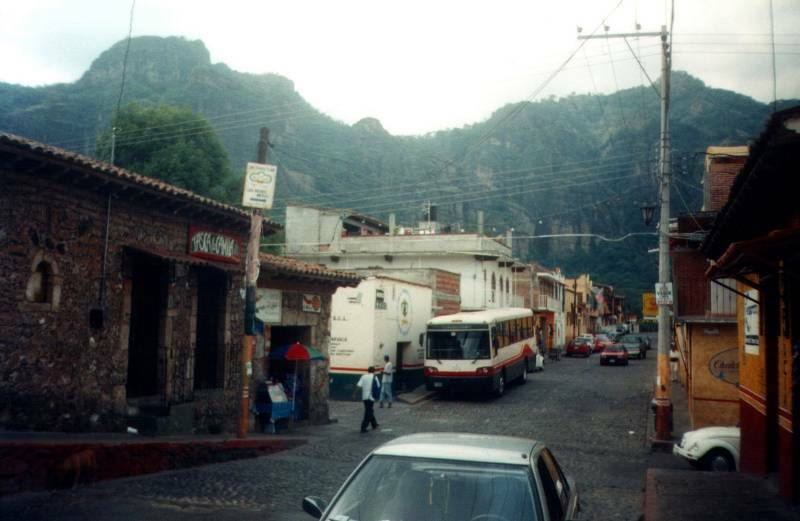 The buses arrive and depart at the edge of Tepoztlán. Just pay attention to where you get off, so you can find your way back again. 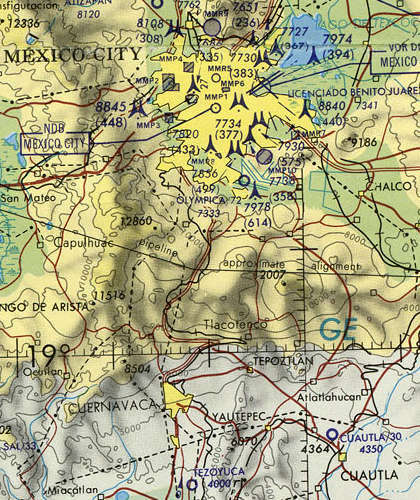 You can find Tepoztlán on this map, just east of the much larger city of Cuernavaca. Be very careful to learn the return bus schedule when you first arrive! The last bus back north is in the late afternoon or early evening, and then there are no more buses to Mexico City until the next morning. Buses run to Cuernavaca until later in the evening, and you could then catch another bus from there to Mexico City. Below you see a local bus making its way through the center of town. 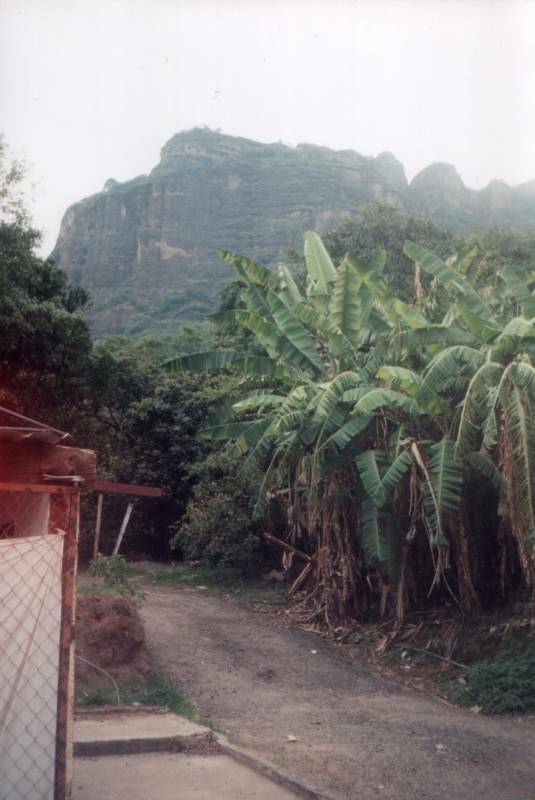 Tepoztlán is up in the mountains and semi-tropical. Many of the locals speak Nahuatl, the Aztec language. tlán means "place of" or "place of abundance". Historians are not certain just which people first settled in the area. Some pottery and other ceramic utensils dating back to approximately 1500 BCE have been found. Nahuatl was the language of the Aztecs, and it has been spoken at least since the 7th Century in central Mexico. It and other indigenous languages of Mexico are recognized as lenguas nacionales or "national languages" and have the same status as Spanish within their regions of use. On the one hand, it's an exotic language with a complicated system of agglutination forming long words with complex meanings. But on the other hand, a number of words in Spanish and English come from their Nahuatl originals. There were many things that the Spanish explorers saw for the first time in Mexico. When they asked "What is that? ", they were told the Nahuatl name. These include: avocado, chili, chocolate, coyote, guacamole, mesquite, mezcal, peyote, shack, and tomato. 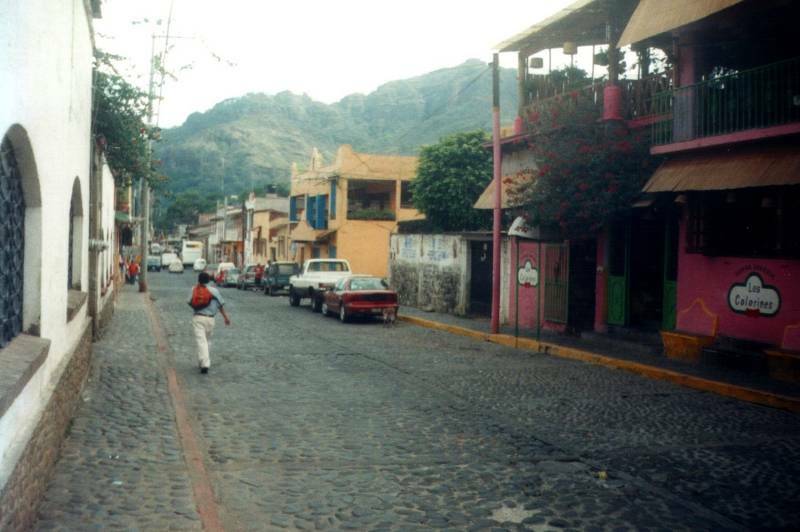 Tepoztlán is the legendary birthplace of Quetzalcoatl, the Great Winged Serpent, around 800 CE. The Toltec culture was dominant in the area by the 10th century CE. A very important Toltec leader, Ce Acatl, later known as Topiltzin Ce Acatl Quetzalcoatl, is said to have been born in Tepoztlán. Historians argue over the extent to which the stories about the legendary king describe actual historical events, and over the degree to which this king, if real, was the historical basis of the deity. Worship of feathered serpent deities is documented at Teotihuacan in the period from 400 BCE through 600 CE. This was the first use of the feathered serpent as an important religious and political symbol. Teotihuacan fell around 600 CE, and the feathered serpent spread through Mesoamerica in 600-900 CE. Then, from 900 until the arrival of the Spanish in 1519, worship of a feathered serpent deity was centered on Cholula, the primary Mexican religious center at the time. The largest pyramid ever constructed was dedicated to Quetzalcoatl at Cholula. Some historians feel that the feathered serpent symbolized fertility and political structures within the Teotihuacan empire. Others group the feathered serpent as the god of vegetational renewal with two other deities: Tlaloc, the deity of rain, lightning, and thunder; and the Cave Goddess, the deity of motherhood, reproduction, and life. There was also a connection between Quetzalcoatl and the planet Venus, with the feathered serpent handling vegetational renewal and Venus as a sign of the beginning of the rainy season. Teotihuacan and the Aztec culture also both associated Quetzalcoatl with warfare. The Mayans also had feathered serpent deities of warfare, Kukulkan and Q'uq'umatz. High cliffs loom over the town to the north, 400-600m high. Up the cliff 400m above the town is the 10m-high Pirámide de Tepoztéco, honoring Tepoztécatl, the Aztec god of harvest, fertility, and pulque.